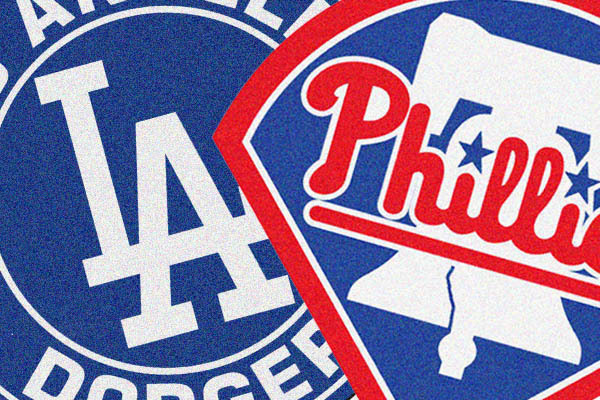 The Los Angeles Dodgers come to Philadelphia after going through a humbling stretch that saw the club drop 11 straight earlier this month. Clayton Kershaw ended the skid and he'll be on the mound again tonight to open a four-game set at Citizens Bank Park. Kershaw (17-3, 2.12 ERA) is 3-4 with a 2.92 ERA in 11 career starts against Philadelphia. He gave up two runs (one earned) in six innings, allowing eight hits and a walk while striking out six last Tuesday as the Dodgers beat the Giants. Opposing Kershaw for the Phillies in the series opener is rookie Nick Pivetta. The 24-year-old has struggled in his past two outings, giving up 13 runs over 10 innings. Despite the struggles, Pivetta still has an opportunity to finish the season on a high note while aiming for a spot in next year's starting rotation come Opening Day. Pivetta faced the Dodgers in his debut earlier this year, surrendering two runs on nine hits in five innings. Rhys Hoskins finished the weekend series with Oakland 0-for-11 with six strikeouts. To avoid 100 losses on the season the Phillies have to go 5-8 or better in the final 13 games of the season in contests against the Dodgers, Braves, Nationals and Mets. Only the three games against the Braves are on the road.